The EC fall varsity athletes began the season with wins all around. The Mountaineers play to win, and their hard work paid off during the first week of competition this fall. Our academy athletes are back to practice this week. More to come on their accomplishments as they kick off their seasons. 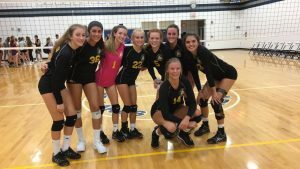 The varsity volleyball team launched their season taking on Southfield Christian in a 5 set thriller on Tuesday, August 21: 25-5, 16-25, 27-25, 10-25 and 19-17. They returned to the court on Saturday at Oakland Christian winning first place in the silver bracket at their tournament. They made it 3-0 for the season on Tuesday, August 28 with a 3-0 set shutout verses Our Lady of the Lakes. The season is off to a great start! 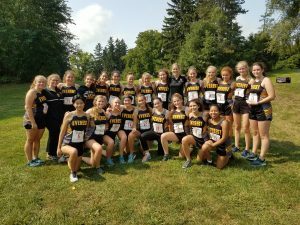 The girls’ cross country season had an early season debut at the Michigan Catholic Invite at St. Francis Retreat Center in Dewitt. After a thunderstorm delay, Avery Herrgott led the team’s varsity squad with a time of 23:47 followed by Erin Booms (23:59), Kate Funke (25:25), Molly Milosch (25:40), Kirsty Liu (26:06), Gabi Lazzara (27:20), Molly Burgess (28:31), and Kate Engle (29:04). The Mountaineers will have some change-up on the varsity squad going into next week’s first CHSL contest on Tuesday, September 4 with JV runners Theresa Waller (25:11), Emily Callaghan (27:29), Scarlett Hamilton (28:04), Abby Milosch (28:12), and Olivia Mandziuk (28:33) showing up strong on Saturday. Four EC runners beat last year’s fastest Mountaineer time from the same meet last year. Despite running against schools from larger divisions, the team ran hard and placed ahead of a few of the other teams. The team participated in the Mass held on the retreat center lawn after the meet. The team has their sights on breaking some school records and participating in the state meet. 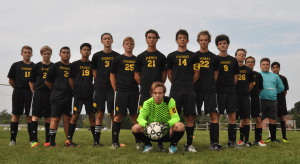 The boys’ soccer team also took on Southfield Christian on Tuesday, August 21. A goal scored by Fernando Caccia and a shutout by goalie Shane Dolan led the team to victory. After falling to Oakland Christian and Riverview Gabriel Richard, the team now sits a 1-2 in the season. The Everest Collegiate Mountaineer Football Team – “Team 6”, opened their 2018 season on Friday with a 36-13 win over Auburn Hills Oakland Christian. The Mountaineers jumped out to an early lead scoring on their first possession when Senior Josh Legg capped off a 10 play, 70 yard drive with a 3 yard TD run. Freshman Jimmy Neme ran in the two-point conversion to give EC the 8-0 lead. The Mountaineers would take a 21 -7 lead into halftime thanks to TD passes from Sophomore Giovanni Mastromatteo of 66 yards to Senior Nino Mastromatteo and 40 yards to Neme. The Mountaineer defense opened the contest with 4 straight 3 & outs and limited the Lancers to 47 yards on the ground and 7 first downs for the game. The second half began with another forced 3 & out for the Mountaineer defense. EC capped off the scoring in the 3rd with two Josh Legg touchdowns, a 1 yard run and a 5 yard reception, giving the Mountaineers a commanding 36 -7 lead heading into the 4th quarter. Legg led the Mountaineers with 199 yards on 26 carries behind a strong effort from the offensive line led by Sophomore John Suran, while Giovanni Mastromatteo was 7/14 in the air for 181 yards and 3 TD passes. Nino Mastromatteo had 3 receptions for 121 yards. Overall, the Mountaineers ran for 289 yards on the ground. Defensively, the Mountaineers were led by Senior LB Max Engle with 6 tackles, including a sack, while DT Suran added 5 tackles and a sack. Corner Nino Mastromatteo and Senior LB Trevor Myers added 4.5 and 3.5 tackles respectively. The Mountaineer defense had 4 sacks and 4 tackles for loss. EC continues the 2018 campaign on Thursday at 7pm with their home opener against Rochester Hills Lutheran Northwest. The game will also feature “CYO Night”, with free admission to those CYO players wearing their football jerseys to the contest. All EC athletes thank the fans who have come out to support them this week! Go Mountaineers!